Make sure the lysine supplement you take passed our quality review and is right for you! Lysine (also known as L-lysine and commonly sold in the L-lysine HCl form) is an essential amino acid. Some evidence suggests that it may help prevent and reduce symptoms of cold sores (herpes simplex labialis), genital herpes lesions, and canker sores. Lysine is also commonly recommended to prevent and treat feline herpesvirus 1 in cats. But does lysine work for these uses? Which lysine supplements provide the highest quality and best value? 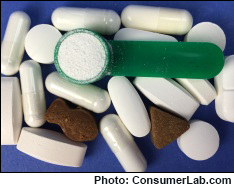 To answer these questions, ConsumerLab.com recently reviewed the clinical evidence for lysine and purchased and rigorously tested many lysine supplements (including two cat chews) to be sure they contained what they claimed and that tablets would properly break apart for absorption. Our tests found one product which we consider misleading, providing just 83.2% of the lysine one might expect from its label. Fortunately, we also identified a number of high quality lysine supplements which contained their labeled amounts of lysine and could properly release their ingredients. However, there were significant differences in cost, ranging from just 4 cents to 33 cents for the same dose of lysine, so we identified those providing the best value. We also tested two lysine chews for cats — one of which provided lysine at a much lower cost than the other. How lysine supplements compare on quality and cost and which provide the best value. What lysine can and cannot do for your health, and your cat's health. How to read the labels, so you know how much lysine you can really expect from a product without being fooled. Lysine dosage for uses including cold sores, genital herpes lesions and canker sores. Concerns, drug interactions, and potential side-effects of lysine.